The perception that a classical concert requires a lot of rules to enjoy a concert is not far from the truth. Rules and etiquette, written and unwritten, create a very long list from what to wear to when to clap that can be very off-putting for newcomers and regular concert goers alike. On top of the general etiquette, there is a perception that one must be taught many things about the orchestra. Does information about the composers, the instruments, and the music need to be distributed and discussed before an audience member can properly understand and ultimately enjoy a concert? Let me ask that question a different way. Will you join me for a hike? Let’s take a field trip to a national park. At that national park, we come across a nature center that has park rangers, environmental interpreters, books about every item one might find on a hike, and free hiking maps in the pamphlets. We’ve been looking forward to taking this hike in this national park for a while so let’s bypass the rangers, the interpreters, the books, even the informational videos, and get on that trail! As we head out of the visitors center, let’s grab one of those map pamphlets just in case we want to adjust our day hike. As we walk through the forest, we hear a distinctive bird song. What is that? Never mind, we have a lake to get to for our destination lunch. We walk a bit more and almost step on a snake! Is it venomous? Never mind, it was faster than we were and disappeared. We make it to the lake and sit down for lunch. This beautiful spot brings us clarity, peace, calm, and wonder all at the same time. We start to appreciate the beautiful rocks, the icy waters, the snow left over from multiple winters. Somehow, we feel excited, rejuvenated, and recharged. Heading back after an exciting day, we are left with all kinds of questions. We stop by the visitors center and ask the ranger about the bird we heard. We tell the wildlife interpreter about the snake we saw; it was a garter snake…harmless. We watch the 20-minute movie we could have watched before exploring the woods during the hike. But did we do it wrong, should we have talked with the experts and watched the video first? I don’t think so. There is no right way to enjoy a hike in the woods. One doesn’t need to know every type of rock, every flora and fauna to fully appreciate nature. One needs curiosity to perpetuate the experience, the on-going experience. 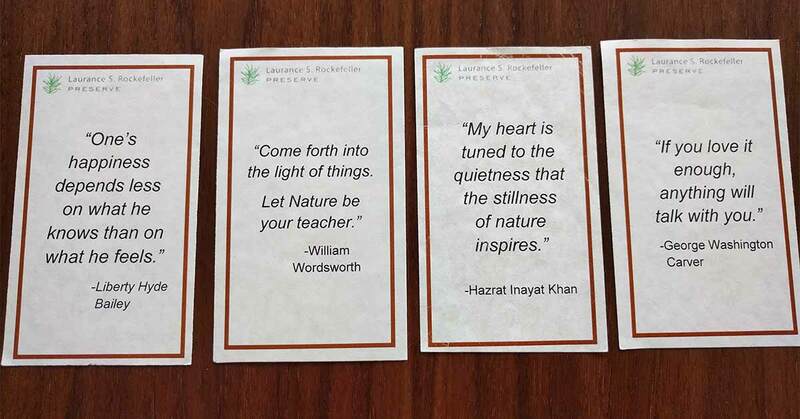 By going into the woods and letting the experience shape our curiosity instead of having expectations, our minds were suddenly open to the possibility that we might be interested in rock formations, bird species, and types of snakes. Before the hike, I bet we might not have cared or thought to appreciate all of those. While a concert hall experience is not a national park experience, the way some people gain curiosity, and ultimately passion, is similar. Having all the information up front, right in your face, doesn’t guarantee enjoyment. Self-discovery and ownership of the experience will ultimately bring more joy to newcomers. The journey of personal curiosity is unique to everyone. Whose concert experience is this anyway? It’s yours. There are no rules on your enjoyment. You decide how and where your journey will take you. When you get curious, there will be more information to take in, I promise. 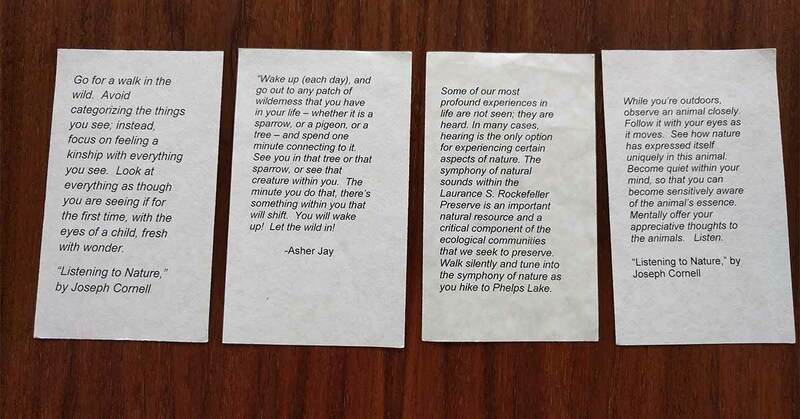 In the meantime, check out these fantastic cards that visitors to the Lawrence Rockefeller Preserve could take with them on their hikes. How could orchestras simulate such a simple and beautiful way to enjoy and enhance a concert experience? Pure poetic prose. Thanks for educating, uplifting, helping train us audience members. Very good both for beginners and a reset for the experienced. But I would suggest that there must be one rule, and that is to not disturb the enjoyment of your neighbors. Basic classroom etiquette: no talking, singing, playing with phone, kicking seats. excellent, I agree completely. I think I’ll write another blog covering that again, it’s time!